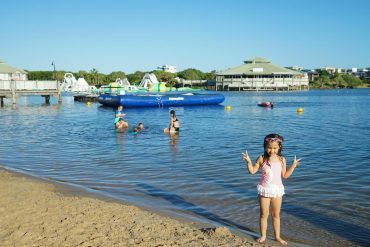 Heading to Noosa always feels like we are cheating on our two favourite beaches north of Brisbane – Bribie Islands Woorim Beach and Kings Beach, Caloundra. 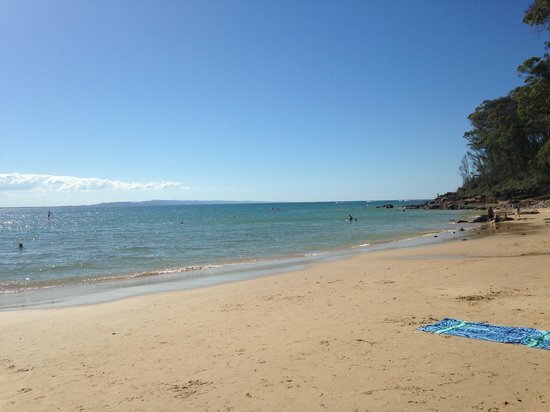 However, Noosa’s Main Beach takes the crown for the best beach within an easy day trip from Brisbane. Each time we visit, we wonder why we don’t go every weekend? There is no mistaking it, Main Beach, Noosa is stunning. Attracting an equally sophisticated and elite beach going crowd. Along Hastings Street the main commercial and hipster hub of Noosa, you will find chic restaurants and boutique shops. 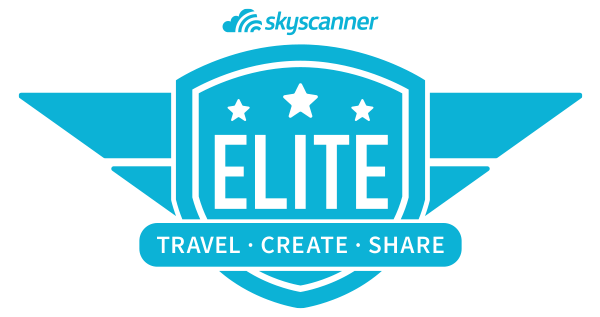 Here is where you will catch hot mama’s wheeling their matching bugaboo strollers, polo wearing retirees sipping latte’s in the cafes and fabulous couples driving their equally fabulous European convertibles. 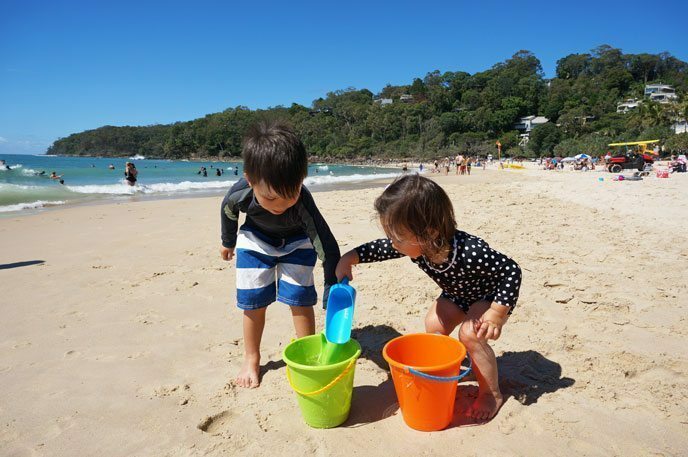 Noosa’s Main Beach, a sheltered golden sandy cove, nestled against the green hinterland is the headlining act for Noosa escape with kids. 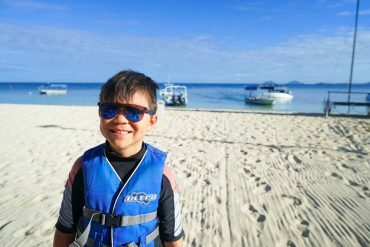 The patrolled beach is great for families as the waves are often small and the clear blue water with hint of sparkling emerald is invitingly warm – even in the winter. Victorians love it as they can spend hours in the water and not freeze like the beaches in the Southern and also the West Coast. For us Queenslanders it is a touch cool, but that’s only if you’re picky like me and perfectly swimmable nevertheless. Along the beach is a pretty boardwalk that connects the Main Beach to the entrance of the National Park. When you tire of the beach, a refreshing drink from the coffee shops along the boardwalk is not far away. 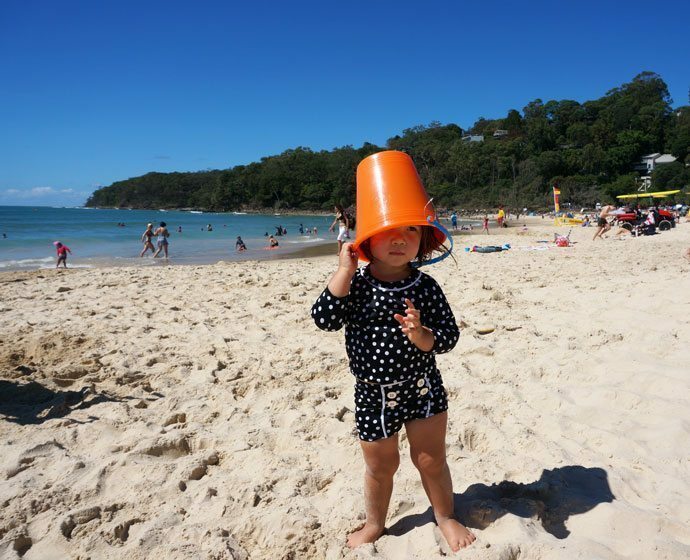 She has a bucket, Noosa Main Beach. Noosa does get busy, it’s often hard to find a parking spot around the Main Beach and Hastings Street. The public car parks further back from the beach can also be full on a weekend or during school holidays. There’s also plenty of interstate and international tourists flocking to join the altogether gorgeousness of Noosa. Once you eventually find a park (and you always do), you’ll feel right at home home on the beach and the air of snootiness dissipates. There are all walks of life rubbing shoulders. From the relaxed surfing community hanging out by the Noosa Heads Surf Club, the many local and out of town families with kids of different ages, the bucket load of tourists; travellers from all over the world, day trippers, interstaters, weekenders and backpackers chilling beachside. Everyone wants to be part of beautiful Noosa. 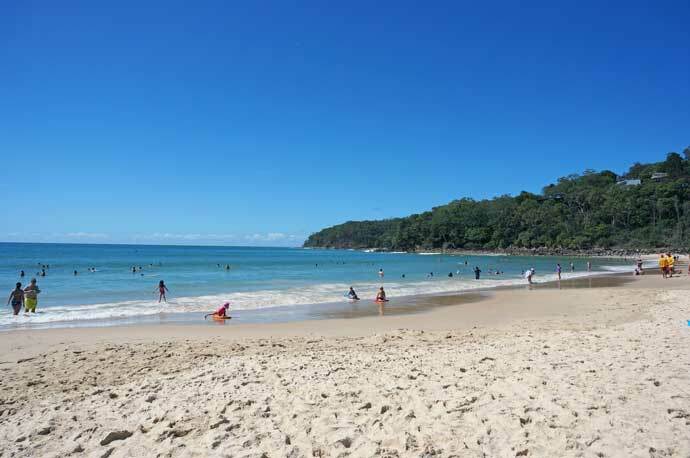 Noosa is one of those year round destinations, we recently visited in April, considered to be the wet season and it was an absolutely glorious day. However, the wet season is not officially over in April and there are higher chances of rain. 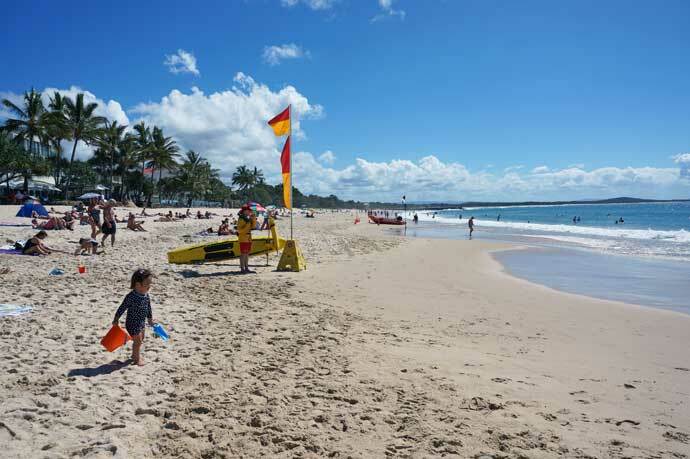 Noosa’s weather is more predictable in the Winter and Spring months or Queenslands dry season. 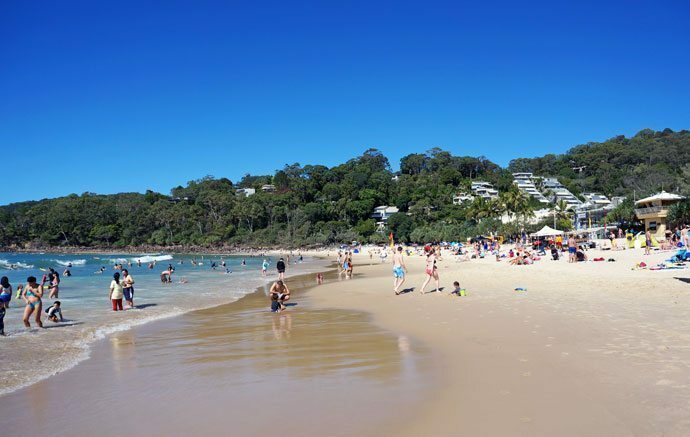 Spring is the perfect time to goto Noosa, with maximum sunshine, little rain and average temperature range from 22°C to 25°C . The water is warm enough to swim. 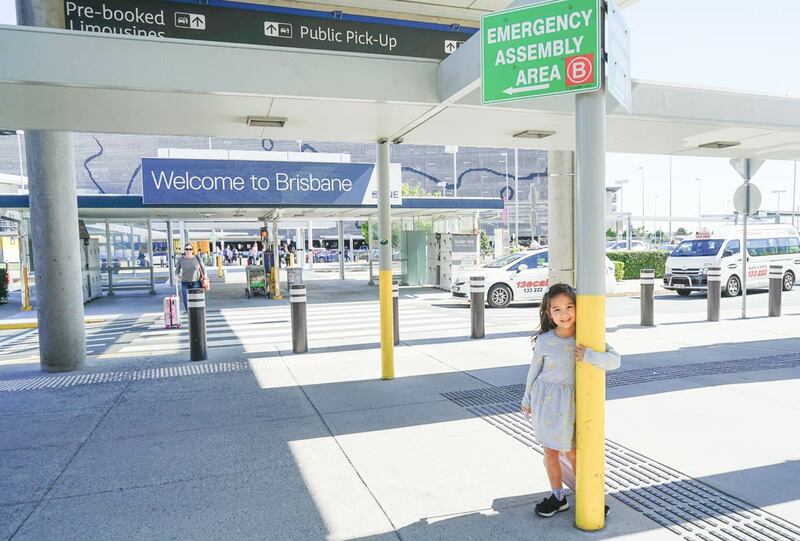 The secret to visiting Queensland is actually in the dry months. Winter is great for a visit to the Sunshine Coast. Though the water can be a little chilly for a local. It’s simply balmy for the majority of the world. During winter you will experience clear blue skies, lowest temperatures can be 20.9°C during the day and 10.2°C at night. Noosa’s Main Beach has little shade, it’s best to bring your own shelter. 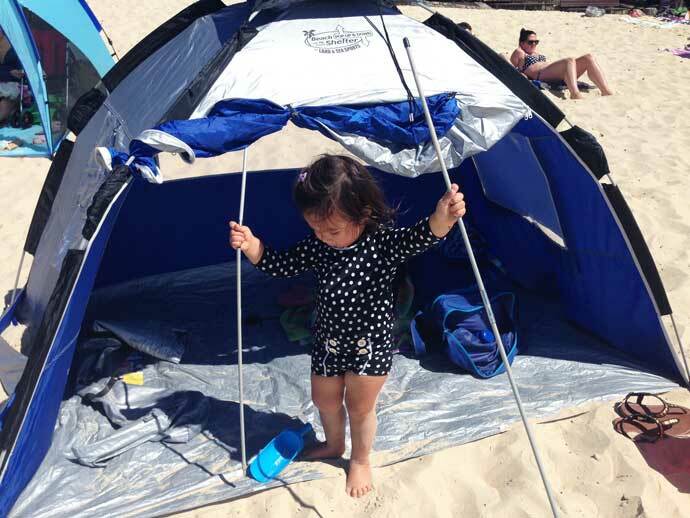 We take a beach tent and you will find many families setting up with variety of beach tents or umbrellas. 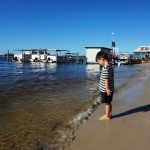 Noosa with kids? Beach tent for some much needed shade. The Aussie sun is scorching and the Sunshine Coast is that bit closer to the equator where you feel the burn. 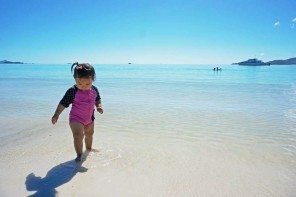 Pack a decent SPF sunscreen, hats, and a good rash guard for baby and toddler’s sensitive skin. I’ve seen some pretty cool beach toys and gear, checkout our Pinterest board, but a bucket and spade can keep the kiddos entertained forever. Though the cafe’s and shops aren’t too far away to purchase water. It’s handy and cheaper to bring your own water bottles and a few snacks. A walk to the shops? There’s no chance you can peel the kids away from the beach to eat or hydrate. Some families are even set up with esky’s with lunches and chilled snacks. I vow to be one of these organised mums one day. Though we leave ours in the car, a stroller is handy for toddlers and babies, it helps move kids quickly, is a comfy spot to take a nap and you can pile all your gear on it when leaving. There’s quite a distance to cover if you are parked further away so a stroller comes in useful to transit kids from car to beach. We also spot strollers on the beach each time we go. 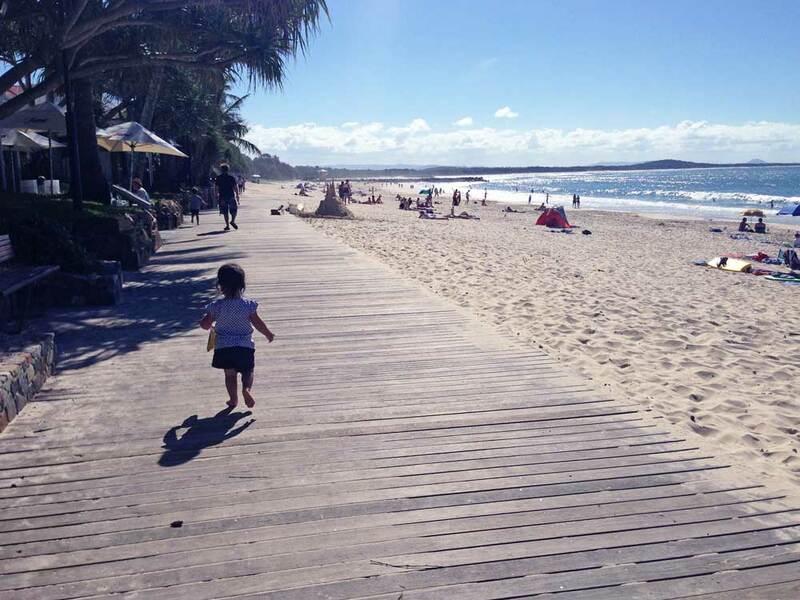 The boardwalk along Noosa’s main beach is very stroller friendly, although you may need to lift and carry the stroller over sand for that prime spot on the beach. Go early to secure a park at Noosa. If you arrive by lunch time, all the good spots have been taken. Along Hastings Street there are 2-hour free parking bay, though they are a bit of a pain if planning to spend the day on the beach with someone having to run back to the car to move it and find another one. There’s also a small car park right on the Surf Beach entrance with a longer stay. These spots can be gotten on on a whim and a prayer. Still worth a shot if you are lucky. Check out car park areas here. Just by Noosa Junction, near the bus terminal, where Noosa Parade and Noosa Drive intersect to form a roundabout, occupies a large car park, on either side of Noosa Drive. A parking spot can often be located here. Another spot which requires a solid 15 minute walk with the kids and your beach gear is by the entrance to the National Park and roads surrounding it. It’s a good choice for people spending the day as the parking hours are longer and offers a nice scenic walk to the beach. Take the boardwalk all the way to Noosa Main Beach, passing Little Cove which is another less populated family friendly beach. There are showers, a baby change area and toilets right on Main Beach entrance by the Surf Life Saving club and carpark. 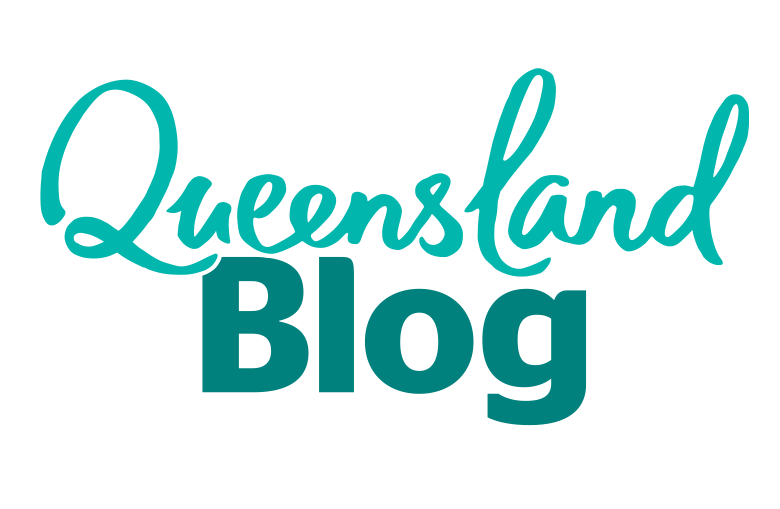 Here is a list of all public toilets around Noosa. Just down from Main Beach is Little Cove Beach. It is as the name implies, a picture perfect little cove. 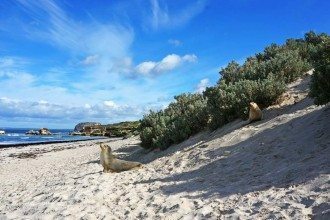 Though it’s unpatrolled, it’s a sheltered beach ideal for families wanting to escape the crowds. It’s just as beautiful as Main Beach set away from the Noosa development. Noosa Heads Surf Life Saving Club right on Noosa’s Main beach, underwent a major refurbishment in 2009. It has a lovely open deck with unobstructed views of Noosa Beach. A great spot for a casual meal and sunset libations. They even offer a “nippers tucker” menu. Off Hastings Street, there’s Bay Village Food Court which has a few fast food outlets such as Kebab, Burgers and Sandwiches. Nothing exciting but OK if you are looking for a quick bite. 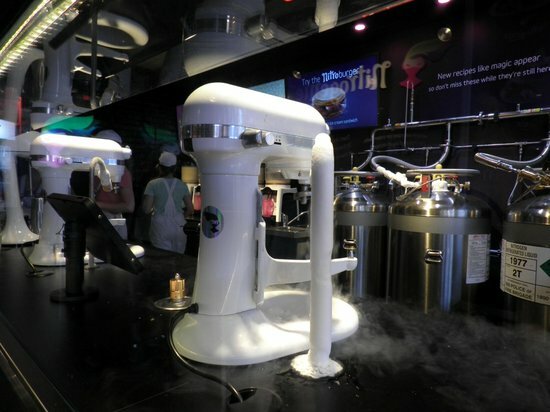 Ice creams made super smooth from liquid nitrogen. 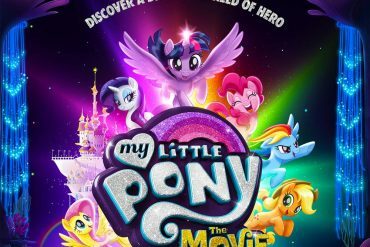 Fun for the kids, check out the menu here. 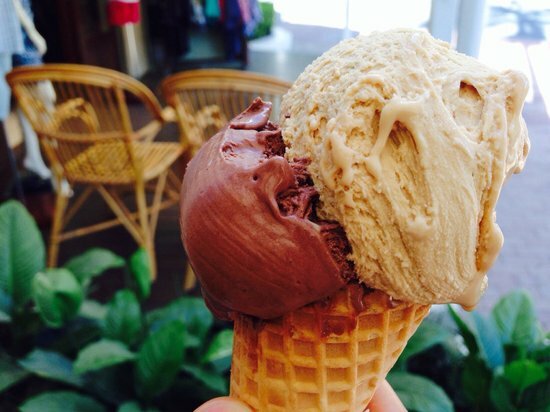 The best gelato is Massimos, 75 Hastings Street, Noosa, Queensland, Australia. Not as fancy as Nitrogenie but the taste makes up for it. The only down side they do not offer free tastings. 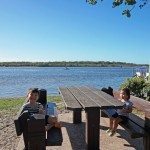 Escape the crowds of Noosa Heads and take 5 minute drive to Noosaville for excellent fish and chips along Noosa River at Red Emperor. 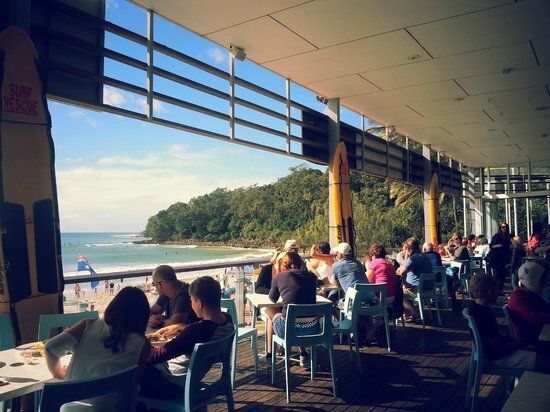 Here is where you get a feel for the laid back and relaxed side of Noosa. 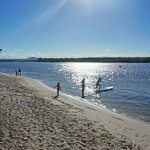 There’s quite a bit to do around Noosaville, with tranquil Lake Webya close by and water activities on Noosa River, boats can be hired just across the road from Red Emperor. From the face of it, it’s nothing too fancy, but this fish n chip shop is an institution and often gets queues out onto the road during peak holiday periods. It’s one of those fish n chips that throw in a couple of potato cakes and don’t charge for sauce. The portions are big and delicious and afterwards you can grab an ice cream and soak up the views across of the river across the road. Do you feel as we always do that a day trip is not enough? It never is, turn it into a weekend or perhaps even a week, which is an ideal time to relax, enjoy and unwind in Noosa. There are lots of accommodation options to choose from. Self contained holiday apartments is the way to go for families. That way you get the best of both worlds, with easy access to Main Beach, Hasting Street shops but also having your own facilities to cook your own meals and extra space. 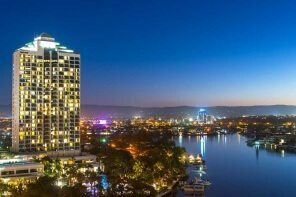 Staying in an apartment close to Hastings Street means avoiding the frustrations of car parking in Noosa as most resorts have car parks on site. 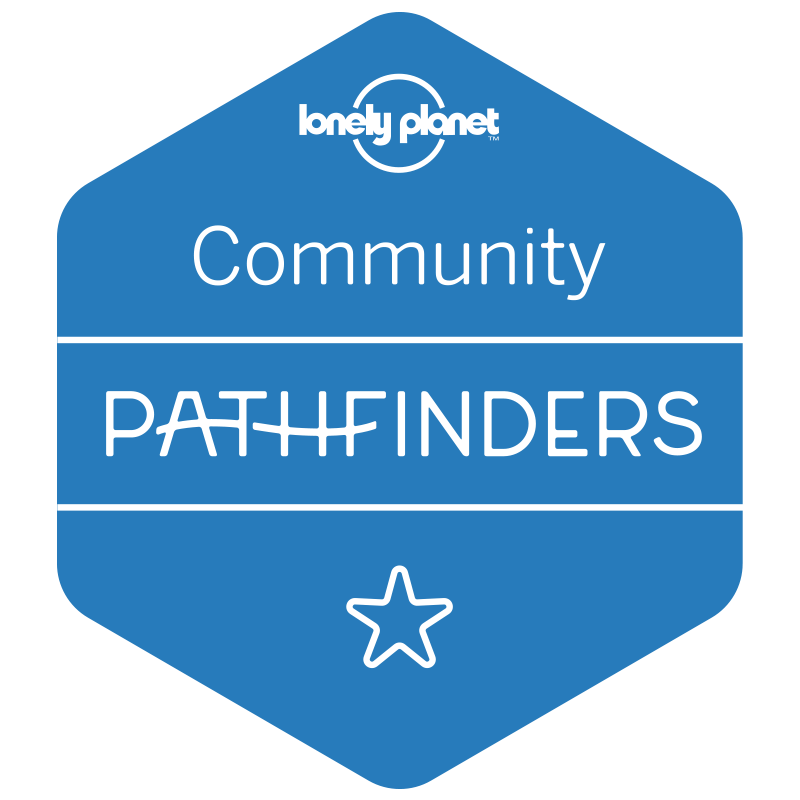 Here are a few options right on Hastings Street which are self contained and includes an essential when travelling with kids to Noosa. I like the idea of staying close to Main Beach otherwise, you are missing the best part of Noosa. You also have the everything that is great about Noosa on your doorstep without having to drive at all. You are paying a premium for the location and many can be tired and rundown. So bare this in mind when choosing right on the beach. 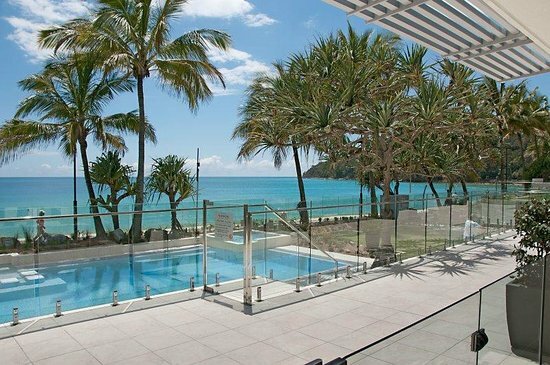 Seahaven Resort has a stunning pool overlooking Main Beach. The 2 bedroom apartments are modern, spacious and with all your creature comfort for a stay in Noosa. 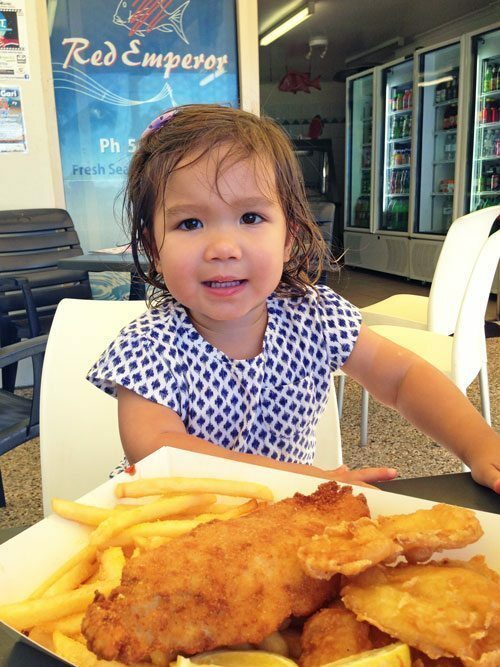 This photo of RACV Resort Noosa Rassimo’s Gelateria is courtesy of TripAdvisor – super set up for kids! The Cove offers beautiful 2 bedroom apartments near Little Cove beach, a great affordable family place to stay. 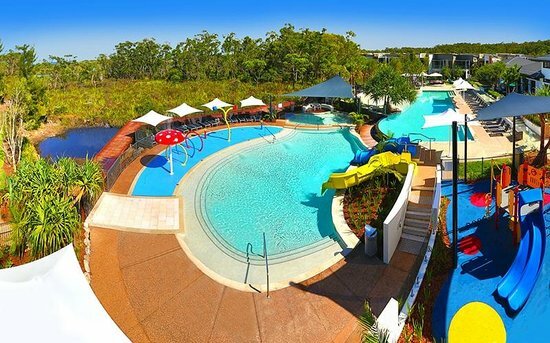 At first look, I thought the RACV Noosa Resort would be something along the lines of a BIG4 camp ground. It’s not! 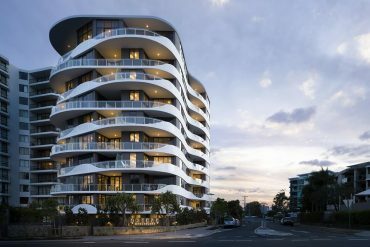 New, modern 1,2 and 3 bed luxurious apartments set in the hinterland. 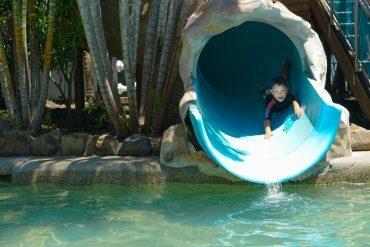 With an amazing kid facilities such as kids pool and splash zone, tennis courts, bike hire, heated beach lagoon, playground and kids dining options. They also have a free bus to Hastings Street, which solves the problem of parking. 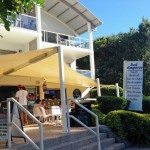 With rave reviews, Montepellier Boutique Resort located in Noosaville is a short dry to Hastings Street and Noosa Main Beach. Clean, light and spacious 2 bedroom apartments with a fantastic resort pool. Ah, Noosa. Brings back memories. You’re very right about the sun, though – I get burned more easily in Australia than in most countries around the world. Ozone layer? Who knows. Love to see you pics! I’ve heard about the ozone or the sun being closer or something? I use to bake under the sun in the Cayman Islands and never got burnt. But here, without sunscreen, ouch.